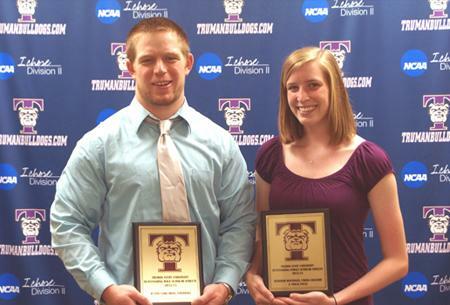 Megan Sharpe, a two-sport star and four-time volleyball all-American, and Jerod Simek, a nine-time swimming all-American, have been selected as the Truman State University Outstanding Student-Athletes for the 2012-13 season. In addition, senior football player Justin Corcoran and track and field and cross country runner Deborah Boedeker earned the Senior Scholar-Athlete awards with their 4.00 cumulative grade-point averages. Sharpe has worn the Bulldog uniform a total of 217 times between volleyball and women’s basketball the past four seasons. In volleyball, she was the 2009 MIAA Freshman of the Year and then earned three-straight first-team all-MIAA honors. Sharpe became the first Truman volleyball player to earn four straight American Volleyball Coaches Association (AVCA) all-American awards, being named honorable mention in 2009 and 2012, third-team in 2010 and second-team in 2011. She finished her volleyball career with three NCAA Tournament appearances and four 20-win seasons, while also ranking in the program’s top-10 in hitting percentage (first), total blocks (fourth) and kills (seventh). She posted 77 career matches with 10 or more kills while playing in 135 matches. As soon as volleyball season was completed, Sharpe returned to the Pershing Arena hardwood as a forward on the Bulldog women’s basketball team. In 82 games, she averaged more than five points and four rebounds per game, as the Bulldogs made three straight trips to the MIAA tournament. The 2012-13 Bulldogs won 20 games for just the third time in program history and went a perfect 13-0 at home. Simek concluded his career as one of the men’s swimming program’s top performers, holding school records in the 500, 1,000 and 1,650 freestyle events en route to nine NCAA-II all-American honors. 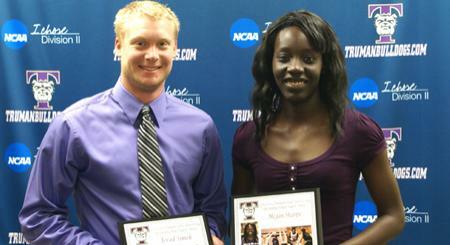 He was a four-time national qualifier and two-year team captain for the Bulldogs. Simek earned three all-conference awards and had 10 top-three finishes at the New South Intercollegiate and Northern Sun Intercollegiate Swim championships. He also served two years as president of the Truman Student-Athlete Advisory Committee. Two mathematics majors at Truman posted perfect 4.0 undergraduate cumulative grade-point averages to earn the Senior Scholar-Athlete Award. Deborah Boedeker is a four-year letterwinner competing in cross country and track and field while setting personal bests in the 400, 600, 800, mile and 3,000 meter steeplechase events. Justin Corcoran has played in 26 games for the Bulldog football team as a back-up fullback and on special teams. He has one year of eligibility remaining. The following staff members were recently elected to the 2013-2014 Staff Council. For complete details on registration, tee times, hole sponsorship and more, visit trumanbulldogs.com. USDirect is offering a $1,000 scholarship where they are asking students to show them their school spirit and team pride with a photo. To obtain more information on how to apply for this scholarship, visit usdirect.com/scholarship. Deadline for entry is June 15. The next issue of the Truman Today will be available online June 17. Looking for a good book this summer? Check out a best seller from the Library’s Popular Reading collection located in the gallery. Or maybe you would prefer an audio book. The Library has more than 600 titles from which to choose. View the Library’s selection at lance.searchmobius.org/search~S6?/daudiobooks. At the Division III national tournament, the Truman Women’s Ultimate Frisbee team received the spirit award. This award is voted on by each team captain after the game and totaled for the entire tournament. For the first time ever, a team was given a perfect five, which means each opponent gave the Truman team the highest possible score based on sportsmanship and positive athletic competition. The Mad Hatter Volleyball Tournament will take place June 8 at the Kirksville Primary School. Participants sign up individually and names are drawn from a hat to determine teams. Proceeds from the event will support sending the Kirksville High School team to a summer camp. For more information, contact Amy Fuller at afuller@truman.edu or visit facebook.com/events/120498988153272. The first session of the Joseph Baldwin Academy will begin June 8. The University Board of Governors will meet at 1 p.m. June 15 in the Student Union Building Conference Room.